Tooth replacement options have come a long way from the days where extraction and uncomfortable, fake-looking “false teeth” were the only answers to the questions of what to do with excruciatingly painful infections and to fill the gap left behind. While today’s dental restorations are lifelike and highly functional, as a practice built upon dentistry with minimal use of invasive techniques in Oakville, ON, Sherwood Dental knows the best tooth is your natural, healthy tooth. Every effort will be made to keep the natural tooth. The Minimally Invasive Dentistry model is designed to control tooth decay and cavities. Preventive techniques include professional cleanings and recall appointments at regular intervals customised to your health history and needs. 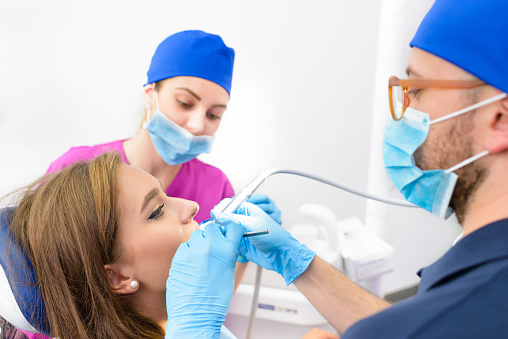 Techniques are accompanied by the latest diagnostic tools to identify and treat conditions before they progress and require costly and invasive restorative procedures. Should decay or an accident threaten your oral health, it may be necessary to restore a part of the tooth, or the tooth structure in its entirety. The Sherwood Dental team only uses biocompatible materials that are gentle to surrounding tissues and optimise your health, knowing the mouth is linked to how the rest of your body feels and functions. We will suggest the most conservative procedure possible to restore your tooth. Inlays and onlays are preferred to crowns, because more natural structure is retained. Maintaining a maximum amount of natural, healthy structure results in a tooth that looks, feels, and functions optimally. A founding member of the World Congress of Minimally Invasive Dentistry, Dr. Stephen Gaines is always researching the latest technologies to support gentle, healthy approaches; for example, lasers fit perfectly with the office as they minimise trauma and unwanted side effects for patient comfort and the best outcomes. Call 844-951-8855 today for a free consultation.